What’s a sending domain ? Sending domain is the one that appears with the From address. For example, if you’re sending with a from address “john@example.com”, then “example.com” is the Sending domain. What’s a tracking domain ? When link click tracking is enabled, Mailfed will replace all the URLs in the email with the application URL for tracking purpose. For example : if you have a URL http://google.com on your email, application will modify that to something like http://mtax.mailfed.com/<RandomString> to track the link clicks. By default, your tracking domain will be mtax.mailfed.com (x is a random number). Disadvantage is that someone reading your emails will see references to Mailfed on the links even though the link will take him to the original site when clicked. Also, it’s not a good idea to have mailfed.com in your emails since the same is used by all category of senders with different reputation levels. So, we highly recommend you to use your own domain/subdomain as tracking domains on your emails. 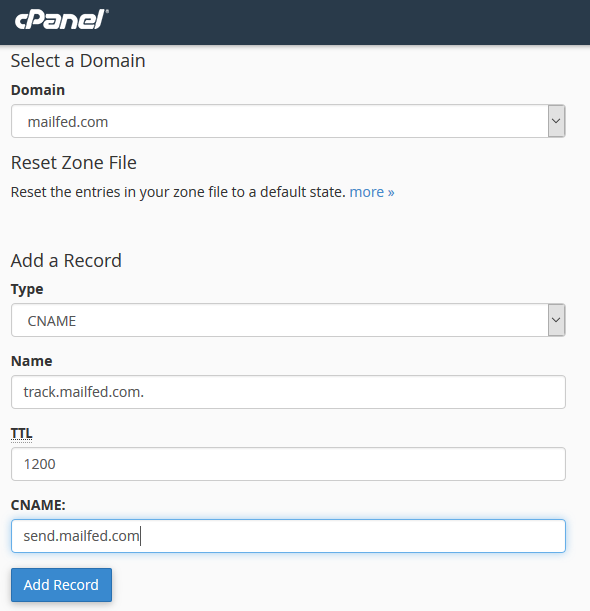 To do this, you just need to create a CNAME record at your domain’s DNS pointing to https://send.mailfed.com and then add and verify this as a tracking domain in Mailfed. 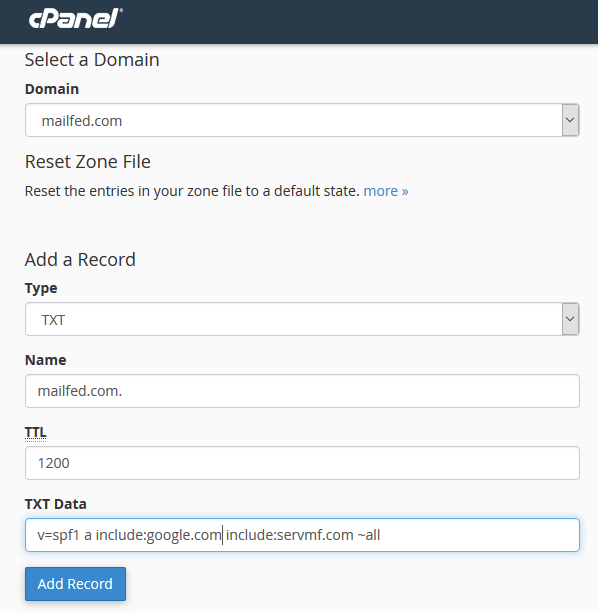 How to add a sending domain ? Input your “From” aka “Sending” domain in there. You can specify DKIM key pair there if you have your own, or just press “Save changes”, system will generate a key pair for you. On the next page, you will be shown 2 DNS records that you need to update/add on your domain’s DNS. 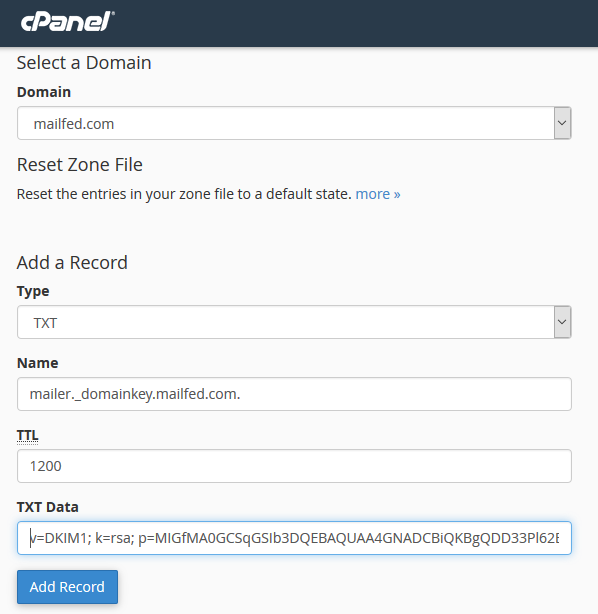 DKIM record – On your DNS zone editor, create a new TXT record with Source/Name as “mailer._domainkey” and its Destination/Value as the entire string starting with “v=DKIM1 …” , omitting quotes. Here, some DNS zone editors will need you to put complete Source/Name address. So, you will have to put something like “mailer._domainkey.example.com.” where example.com is your sending domain. If your host/DNS editor doesn’t allow you to add a lengthy key, please chat with us and we will provide you a shortended CNAME record. SPF record – This is also a TXT record. Here, the Source/Name field would be the sending domain itself. Its value is constant for all the customers – “v=spf1 include:servmf.com ~all” (omit the quotes). If there’s one spf record already, then you just need insert the string include:servmf.com somewhere between “v=spf1” and “all” elements separated by single space. For example : if you have something like “v=spf1 a ip4:10.1.1.2/24 include:google.com -all” already, then you just need to modify it in such a way that it will look something like “v=spf1 a include:servmf.com ip4:10.1.1.2/24 include:google.com -all” Or “v=spf1 a ip4:10.1.1.2/24 include:google.com include:servmf.com -all” etc. Place of the include string doesn’t matter, but it should be separated from other entries by a single space. Once the records are added, click “VerifyDNS” button. Please be advised that it might take up to 48 hours for the DNS updates to reflect globally. Done ! You will now be able to use the above domain as your from domain on your campaigns. You can verify the SPF records on http://spf.myisp.ch/ and http://www.kitterman.com/spf/validate.html . It shouldn’t show any errors. Check the SPF and DKIM steps in the “Major DNS/Zone editors” section to see an example set up. How to add a tracking domain ? As mentioned earlier in this document, tracking domain is just a CNAME record, pointing to “send.mailfed.com”. Follow the steps below to add a tracking domain. Go to Domains > tracking domains. Input a domain/sub domain (in full form) there. Example : tracking.example.com. It’s recommended to use a subdomain of the sending domain as a tracking domain. Go to your domain’s DNS/Zone editor. Add a new CNAME record with Source/Name as “tracking.example.com.” (as per the above example, step #2) and Destination/Value as “send.mailfed.com”. Once the CNAME record is added, come back to Mailfed dashboard and click “Save changes”. Skip validation option must be set to “No”. Now, system will verify the record and will add it to your account if the verification passes. Done ! You can now select this domain as a tracking domain on the “Setup” page of a campaign from the “Tracking domain” drop down list ! Check the Tracking Domain step in the “Major DNS/Zone editors” section to see an example set up. 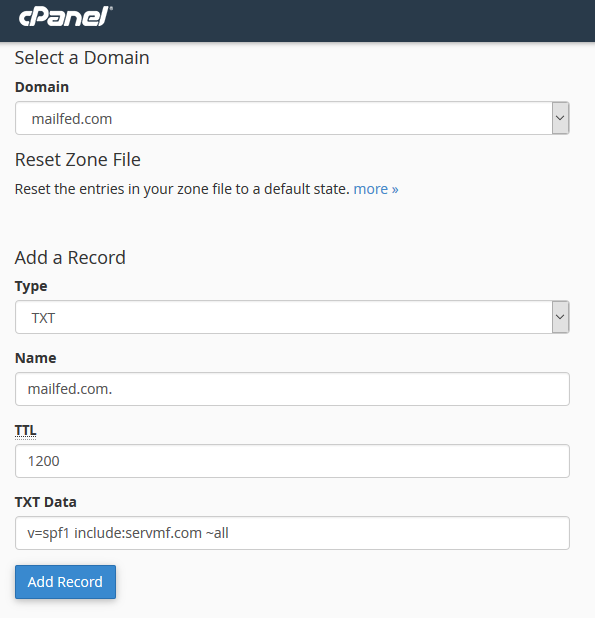 Press “Manage DNS” button against the preferred domain.